Review posted on Dark Faerie Tales.Jill Hathaway’s Impostor is a stunning sequel that entertains the reader with this unique murder mystery. I absolutely loved Slide and couldn’t wait to dive into Impostor. Hathaway brings back Vee, who has a special ability to momentarily slide into a person’s state of mind, allowing her to control the person and their actions. The concept is unique, filling the pages with psychological thrills. Once again Hathaway delivers.Impostor beings six months after Zane’s death. Vee has lost herself trying to cope with his death. She also is coming to grips with the reality of the new status of her and Rollins’ relationship. Vee constantly dreams about the night of Zane’s death. She is haunted because she slide into Zane moments before the crash. Sometimes she dreams of escaping, driving away in a car. But her dreams are slowly becoming real life. One night, she wakes up from her dream of escape to find out that she is actually in a car, speeding down the highway. Vee has no recollection of what happened, putting together pieces to solve the puzzle. Could there be someone else who can slide? Could they slide into her? These are the questions she asks and tries to solve.Vee is someone I loved from the beginning. Impostor allowed me to become acquainted with all of the things I loved about her. Her tenacity and strength carries throughout her actions. She is once again surviving, growing stronger each day. She no longer keeps her ability at bay, allowing her to live in the moment. She has chosen to embrace it for what it is, but this time at an odd price. I never really thought about having another person with the same abilities. 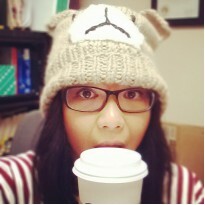 I was so caught up in Vee that it escaped my mind. But the circumstances that Hathaway has brought to the reader is interesting. Vee is inherently good, but what if the other slider isn’t? The actions of a slide has consequences, and Vee is experiencing first hand the ill effects of the slide. The tone of Impostor is a lot darker and fiercer. Hathaway brings this element of horror that is a step higher than Slide. Let me tell you, I was knee deep in reading intensity! I couldn’t get enough of the story, and I needed to know who was the impostor. Hathaway’s world is a realistic one, but the elements and details that she brings to the table allows for the reader to be transported away. I loved everything until I didn’t. The ending wasn’t something I was expecting and it broke my heart. I was expecting something much more different, more sinister and evil. That set the difference between Impostor and Slide. 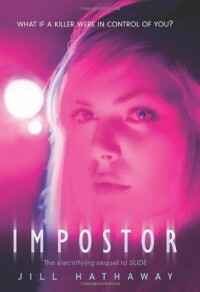 But I will say Hathaway still threw me off.Impostor is still an amazing read, and I urge you to pick it up.